The easiest seeds to save are from non-hybrid annuals or species; avoid seed from hybrids unless you do not care if the offspring are different from the parents. Avoid collecting from plants that are labelled F1, F2, or that are cultivars. Collect seed from open-pollinated or heirloom plants; they are not the products of hybridization and will result in true-to-form offspring. If a plant is not self-pollinating (male and female parts in the same flower, requiring no outside assistance) and there is a risk of it crossing with another variety of the same species, plant only one variety of that plant to avoid cross-pollination. This is extremely common with squash and melons. More than one type of a plant from the same group can be grown only if enough distance separates them, reducing the risk of hybridizing. 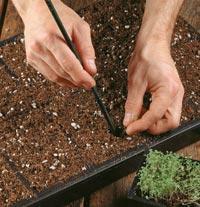 Collect seed from ripe fruit, ensuring that the seeds will be fully mature. Consult a reference to see if a plant is appropriate for collecting its seed. 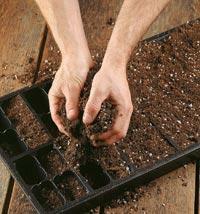 Save seeds from heirloom, rare or hard-to-get plants. Collecting Technique It is imperative to collect seed at the appropriate time. Immature seed will not be viable so it is important to collect seed when it is ripe. Fruit and vegetable seed should be collected when the fruit is at or just past its ripest. Flower seed should be collected when the seed pods are just starting to turn colour and wither. At this point, you'll know that no more energy is being stored in the seed. Some of the easiest vegetable seeds to collect are from beans, peppers, non-hybrid tomatoes, cucumbers and summer squash. For flowers, stick to non-hybrid annuals and perennials. Trying to collect seed from the latest hybrid marigold is probably not the wisest use of your time. Step-by-Step - Pricking Out 1. Fill cell pack with appropriate potting mix. 2. 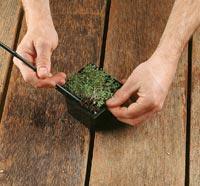 Gently remove seedlings from the seeding pot. 3. Insert seedlings into soil using a small dibble stick to create planting holes, then gently firm the seedlings into place and water lightly.